Disney animation has been kind of stagnant of late. Between 2003 and 2008 (between Brother Bear and Bolt) not a single film was released by them. Once dominant in entertainment, they had a hard time switching from traditional cell animation to computer animation. That and the force that is Pixar (which Disney acquired in 2006) seemed to completely stymie them. 2009’s The Princess and the Frog may be the last “traditional” Disney animated feature we’re going to get, but they have more than made up for it in their computer animated films. Non-Pixar Disney animation films have come out steadily since 2010, and 2013’s Frozen has more than put them back on top. and most profitable acquisition so far (until The Force Awakens perhaps.) The story, a superhero origin story, is a departure from the source material- at least as far as I can tell- turning a relatively dark comic into a bright and cheery kid-focused action film. And, damn does it work. Big Hero 6 is like watching pure joy. Even in the sad or heavy moments, because this is Disney and they must punch you in the heart, the characters are so real and engaging that you can’t help but be excited for what comes next. 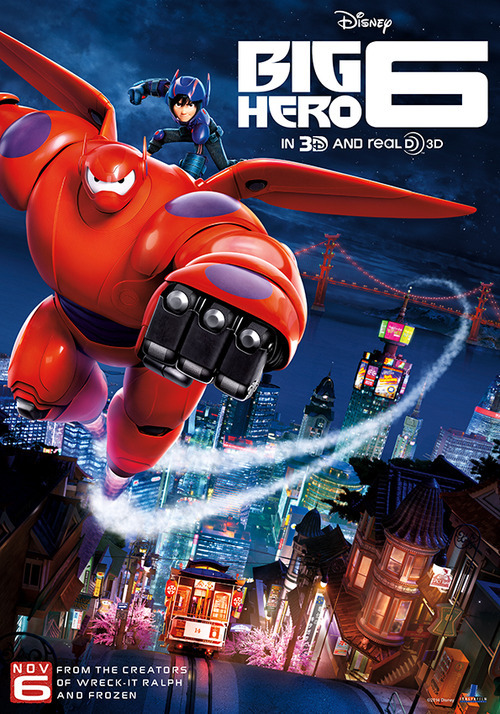 The main characters of Hiro, a genius teen, and Baymax, a medical robot that gets modified into a superhero, are possibly my new favorite on screen duo. Baymax particularly is a wonderful character. Both in design and conceptually the idea of a modified medical robot becoming a superhero is a brilliant idea for the focus of a story. Bolstered by a strong voice cast including Alan Tudyk, Maya Rudolph and the fantastic Scott Adsit as Baymax, this film is simply stunning to watch. While you’re laughing and on the edge of your seat with excitement you’re getting blasted by some of the most fantastic CG animation I have ever seen. The action scenes in this film are amazing in both scope and how many moving pieces are included.